Obscured By War, Water Crisis Looms In Yemen News from Yemen has been dominated recently by an escalating rebellion along the border with Saudi Arabia. But the country has been making news for decades because of its severe overuse of a rapidly disappearing water supply, the result of natural and political causes. Lately, the news from Yemen has been dominated by an escalating rebellion along the border with Saudi Arabia. But for water experts, Yemen has been making news for decades because of its severe overuse of a rapidly disappearing water supply. In 1998, Abdul Rahman al-Eryani was a young local aid worker explaining the desperate water situation in Ta'iz, south of the capital, San'a. Water was so scarce that some households only had it once every six weeks. Eleven years later, Eryani is now the Yemeni government minister of water and environment, Ta'iz residents are still waiting six weeks for water to flow from the tap, and in San'a, the situation has gone from bad to looming disaster. "We are in crisis. And this is expected. ... We are using almost 100 percent more than the annual renewable water that's available in San'a," Eryani says. The alluvial aquifers closer to the surface have been exhausted, and drill bits must now chew through more than 3,000 feet of earth before reaching the ancient sandstone aquifer that holds what Eryani believes is the last of San'a's reachable underground supply. No one knows precisely when the water supply will run out, but there's no doubt that it will, and probably sooner rather than later. Yemenis are responding by drilling illegal wells and pumping more water than ever. On a recent day, well water gushes into Hassan al-Jibouri's tanker truck at a roadside pump along one of San'a's main streets. Jibouri and his fellow drivers spend their days selling water to hotels, restaurants and private homes. He says a typical water delivery costs 1,000 rials, or about $5. If he has to drive a long distance, it might cost a bit more. Yemen's water crisis is, in part, the inevitable result of a rapidly growing population, limited rainfall and finite water resources. 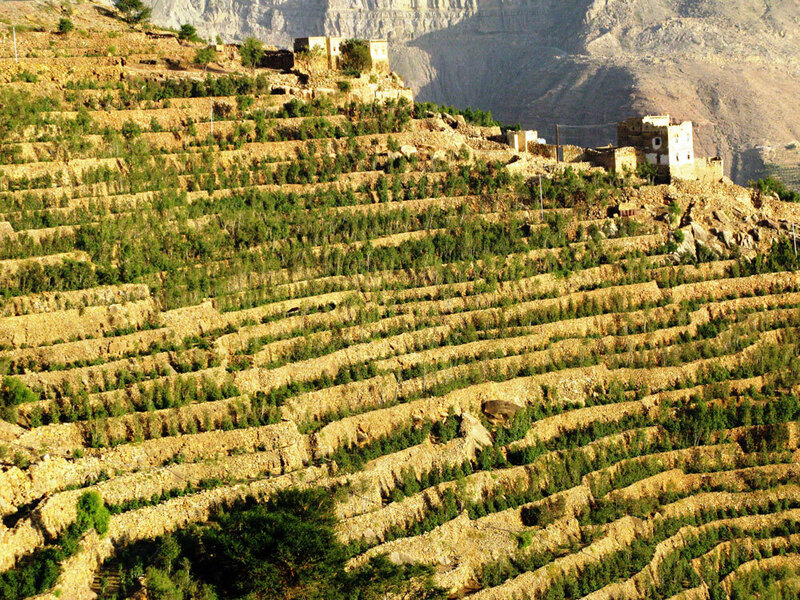 Yemen farmers long ago adopted the practice of terraced farming on steep mountain slopes to capture rainwater. But since the 1970s, farmers have been encouraged to drill wells, depleting limited underground aquifers. About 40 percent of available water goes to khat, shown here on a hillside in northern Yemen. Many Yemenis chew the mildly narcotic leaf. But experts and ordinary Yemenis agree that policy blunders have accelerated the crisis and made it harder to fix. First, there is the massive problem of agriculture. Despite the severe shortages of drinking water, at least 85 percent of Yemen's available water goes to agriculture, where huge amounts are wasted. For centuries, Yemeni farmers captured rainwater for their crops. But in the 1970s, well-intentioned international groups such as the World Bank and the International Monetary Fund showed up with a raft of incentives to get farmers to drill wells and use underground aquifers instead. Anwer Sahooly is a water expert with the German Development Corp., a major player in Yemen's water reform efforts. He says more than 1 million acres of farmland that used to be rain-fed are now irrigated with underground water, using inefficient methods that lose vast amounts of water to evaporation and leakage. "We have to reverse the process now, and make people get used to rainwater harvesting. We have to encourage harvesting from floods, from spit irrigation, from every drop that we get, and stop drilling any more wells," he says. Despite a new law outlawing most private wells, the drilling goes on. The sound of water pumps can be heard on farm plots all around the capital. The most popular crop of all is khat, a plant that produces a mildly narcotic leaf that Yemenis love to chew. Small farmer Abdullah al-Jidri, sporting a softball-sized wad of khat leaves in his left cheek, says many farmers would be happy to grow fruits, vegetables and grains, but they can't live without the cash brought in by khat. "With food crops, we have to wait for a year or longer to get a harvest, and if there's a problem, you won't get a crop. But with khat, you just put some water on it and you have leaves in a month's time that you can sell immediately. It's a cash crop," he says. When asked whether he's heard that the government wants farmers to stop growing khat to save water, Jidri and his brother laugh. "Don't believe the officials. They ask us to grow more khat for them to chew," he says. Other than cash for farmers, Yemenis agree that khat produces no benefit, and in fact impairs the productivity of much of the labor force most afternoons. But efforts to curtail khat production and consumption are so far largely ineffectual. Some long-term reforms are under way, notably the decentralization of water management to the local level. Officials are also replacing open-channel water lines and flood irrigation methods with more efficient pipes and drip hoses. But Sahooly, the water expert, says it is hard to bring water to the top of the agenda in a country with so many problems. "It's very important in my opinion that there should be a champion, at the level of the president, vice president, always talking about water issues. All civilization has grown around water. Water is life, and we have known that for a long time," he says. At the moment, however, a violent rebellion, secessionist movements and a growing al-Qaida presence are drowning out the voices of those warning that a massive water failure could soon be Yemen's biggest problem of all.